There's a bit of snow on the ground. When I got up this morning there was snow on the long wires too but that's gone now. Having finished my soldering, I'm making a data card for digital modes, there wasn't really much to do apart from turn on the radio and test my links from FLDigi and wsjtx to PSK Reporter. 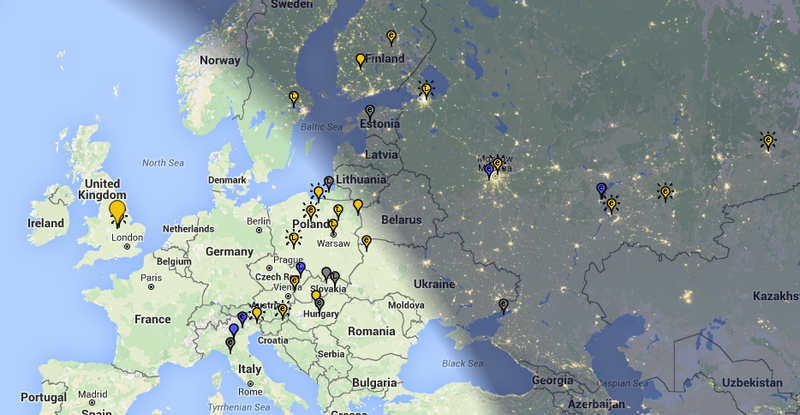 Everything is working just fine and as you can see from the map above I can hear quite a few stations. The furthest being in Asiatic Russia, some 2561 miles away. Not bad for a random long wire stretched across the garden. If you're an SWL and listen to digital modes then the PSK Reporter site is of great interest once you've connected the above two pieces of software to the site. It's simplicity itself and quite exciting to find out just how far away those signals have travelled. And all at the speed of light. Wow! I'm fast becoming an SWL flaneur. Data modes are quite good for grabbing a coffee and my pipe and letting the computer do the work. Today I installed a few bits of software that let me just kick back and watch the screen while daydreaming about the airspace between those transmitting and the long-wire in the garden. 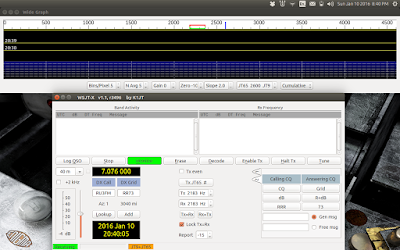 The first was wsjtx which decodes JT65 and JT9. It works very well with the Tecsun PL-660 and picks up amazingly quiet signals. The next one was gpredict which tracks satellites. It gives one a wonderful excuse to sit around for hours waiting for the next satellite event. Excellent stuff. The last piece of software was xlog which as you might have guessed is a logging program. 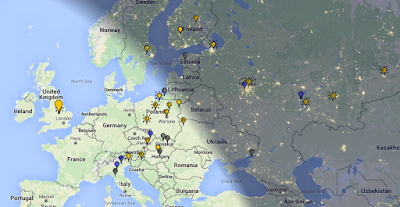 The nice thing about xlog is that one can add the commercial bands on HF and log stations that don't happen to be hams. This means that all sorts of stuff can be logged like pirate stations, numbers stations and that kind of stuff. I'll still keep my paper logs but adding them to a computer log means quick cross referencing. Can't be bad. Just as long as it doesn't interfere with my daydreaming. 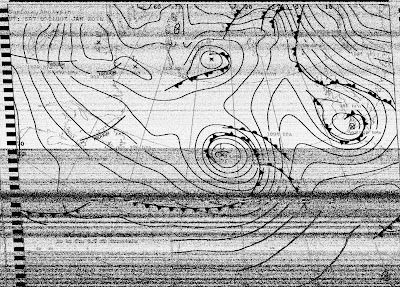 May I present to you my first weather fax image. While this kind of thing is old hat to some people this is all new to me. Having got into digital modes on the amateur bands I thought I'd try my luck elsewhere. 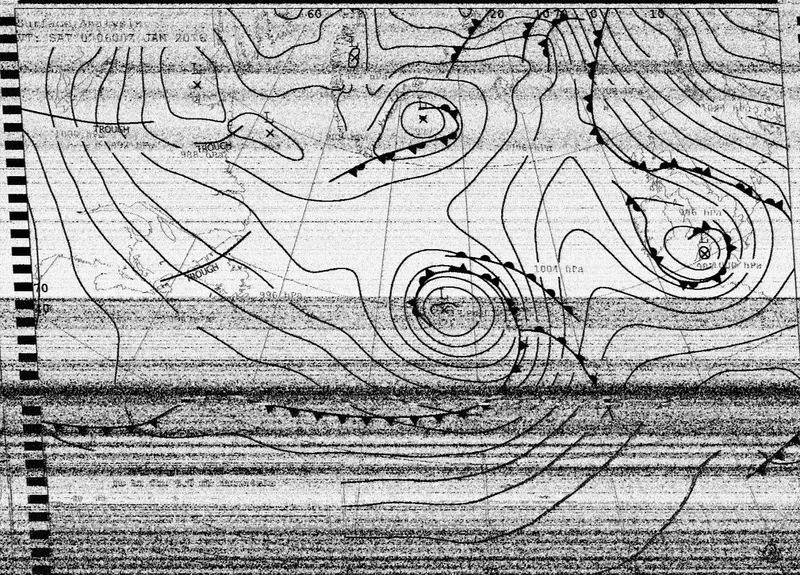 The most obvious choice was to try and decode a weather fax because one is bound to find a broadcast somewhere in the bands. I tuned into GFA Bracknell on 4608 kHz and with a bit of messing around got the fine image above. It's not the best by other peoples standards but for a beginner like me it's not bad at all. One can even make out the UK just above centre right. I wonder what else there is to decode out there? I'm using FLDigi on my Ubuntu Linux laptop for all of my decoding these days with the exception of SSTV which I've yet to set up. So there it is, new year's fun on digital.